Install your aftermarket or factory wheels on your 2015-2017 Mustang with a set of these high quality small diameter closed end lug luck nuts. For 2015, Ford decided to change the wheels studs from the typical 1/2”-20 Thread pitch to 14mm-1.50 pitch. 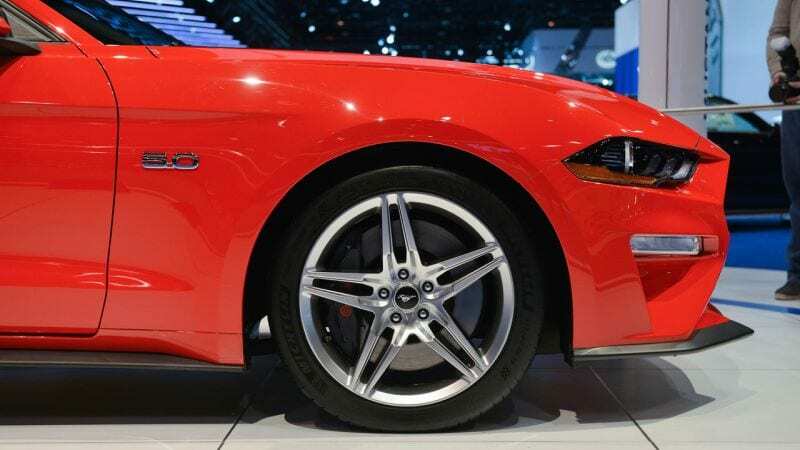 With the 2015-2017 Mustang now being a world-car and producing more power than ever before, Ford felt the need to beef-up the OEM wheel studs for an added sense of security. These Black Locking Lug Nuts have been created, and will not only look great, but will also function perfectly. The Locking lug nut’s closed-end design prevents rusting problems so the lug nuts will always thread smoothly and look great. The external pattern design produces better torque and prevents breakage. They also provide more seating surface than traditional lug nuts. This is achieved from the 60 degree conical seat which is standard with most Mustang wheels. Additionally, each lug nut is stamped with the thread size for easy identification and to prevent confusion amongst existing lug nuts. Most aftermarket wheels are made with smaller lug nut openings which can cause a tight fit for the factory lug nuts. This increases the chances of damaging the wheels with a socket or lug nut key. This locking lug nut kit with small diameter acorn style lug nuts that use a specific thin-walled socket that minimizes the potential to damage the wheels. These Locking Lug nuts are also heat-treated for superior strength and finished in black to accent your Mustang’s exterior theme.